Temperatures across Richmond, Virginia in July 2017. Anyone who’s spent time in a city in the summer knows that these bastions of blacktop get uncomfortably hot compared with the surrounding countryside. But even within a city’s bounds, some neighborhoods swelter more than others, and that can have a big effect on who’s most threatened by heatwaves. Which is why citizen scientists are starting to map out the urban heat island effect. Later this month, a team of researchers and about 20 volunteers will fan out across Washington D.C. and Baltimore to take the cities’ temperatures. Equipped with instruments that log geotagged temperature data every second, they’ll drive or bike the same route three times—at 6 a.m., 3 p.m., and 7 p.m.—to create a snapshot of how temperatures vary throughout the day. Those snapshots will then be assembled by researchers at Portland State University to produce detailed maps of heat disparities across the cities. If similar research conducted in Richmond, Virginia last July is any guide, those disparities can be quite large. Jeremy Hoffman, a researcher with the Science Museum of Virginia who’s helping to spearhead the campaigns, told Earther that temperatures in more industrial parts of Richmond reached 102 degrees on the same day that a nearby shade-filled park topped out at 87. “There’s not a more dramatic example of the human imprint on the Earth system than urbanization and its effects [on temperature],” Hoffman said. When scientists talk about the urban heat island effect, they’re typically referring to the fact that on average, cities are several degrees warmer than surrounding rural areas, largely due to all the impervious, heat-absorbing surfaces we use to construct our roads, sidewalks, and rooftops. But within a city, differences in land usage, building height, tree cover, rooftop color, and even how orderly the streets are all have an effect on temperature, too. 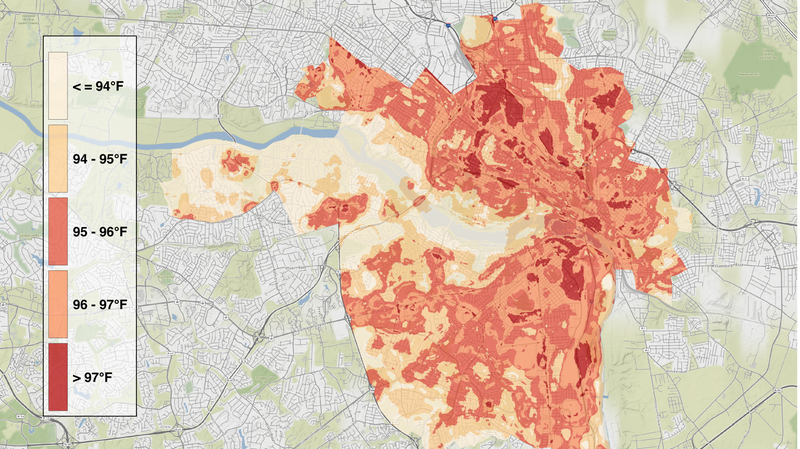 This map of urban heat vulnerability across Richmond, Virginia is being integrated into a city planning report. Taken together, these factors can result in hyper-localized differences in the heat felt throughout a city, which is important information for planners to have as they think about how to address the threat of excessive heat in a warming world. Based on the data collected throughout Richmond last year, project collaborator Vivek Shandas at Portland State and his colleagues were able to produce maps of urban heat across the city as well as heat vulnerability, which takes socioeconomic disparities into account. Those maps are now being used to inform a citywide master plan update, a climate resilience plan, and exhibit designs at the Science Museum of Virginia, Hoffman said. Shandas and Hoffman plan to produce similar maps from this month’s campaigns in D.C. and Baltimore, which are being supported by the National Oceanic Atmospheric Administration’s Climate Program Office. Ultimately, the two are hoping to scale up this effort even further. Shandas told Earther he envisions creating an off-the-shelf set of guidelines that any city can use to launch its own heat island campaign and generate citywide temperature maps. Hoffman sees this as a way to help people to relate climate change to their own lives, and then actually do something about it.